A revolution begins in Portland on 17 January. Justice DeMuniz presiding. You might want to come play your part in it. UPDATE: Installation of new officers, 17 Jan 2015. 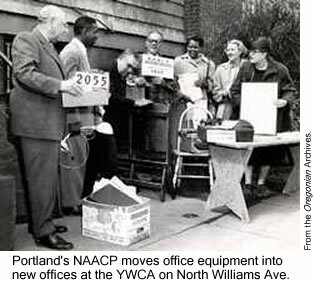 Portland’s NAACP Chapter will have new leadership. Consult Hardesty’s Principal Partner, Jo Ann Hardesty, has been elected President. James Posey will serve as 1st Vice President. “I am humbled by the faith the Chapter has placed in me, to lead our efforts during this historic time. 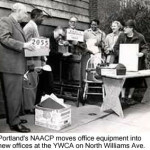 This year marks the 100th anniversary of the NAACP Portland Chapter, and the need for this civil rights organization is as pressing today as it was a century ago,” declared Jo Ann, in her November press release. Installation of new leaders will take place at noon on Saturday, 17 January 2015, at the Oregon Trail Chapter of the Portland Red Cross. Retired Oregon Supreme Court Chief Justice Paul DeMuniz will swear in the new team at the beginning of the Chapter’s first, monthly meeting of 2015. UPDATE: Marilyn Keller will perform. All are invited to share in plans to revitalize the Chapter. High priorities include developing a youth branch, and celebrating a hundred-year perspective of the group’s work. Jo Ann has challenged her new board to recruit 101 new members. Here is an application. Bring payment to the January meeting, or mail it to the Post Office Box at the link. We’re asking all social justice advocates (you, reading this) to solicit three friends for membership. Consider making an additional $15 donation to cover one youth membership. We’ll be offering these in order to establish a Youth Council in Portland, part of a critical mission handed to the Chapter by the Alaska Oregon Washington State Area Conference (AOWSAC) of the NAACP. There’s plenty of room under this tent. General advocacy topics include “the promotion and protection of civil rights, securing a fair and equal criminal justice system, ensuring high quality educational opportunities for all Americans, a fair labor environment, and securing affordable adequate housing and health care for all Americans.” From Climate Justice, immigration reform, a living wage and campaign finance reform, to the New Jim Crow awareness growing in Portland, we think many of our friends will find ample means to advocate for their passions. If you value strength in numbers; and highly organized, intentional collaboration; bring your talent, enthusiasm and energy to the inaugural meeting. ACT-SO, Armed Services & Veteran Affairs, Communications, Press & Publicity, Community Coordination, Criminal Justice, Economic Development, Education, Finance, Freedom Fund, Health, Housing, Labor & Industry, Legal Redress, Membership & Life Membership, Political Action, Prison Branch, Religious Affairs, Young Adult, Youth Works, and Women In NAACP (WIN). With more than a half-million members and supporters throughout the world, we hope you’ll become a local ‘premier advocate’ for civil rights in your community. The work is important. 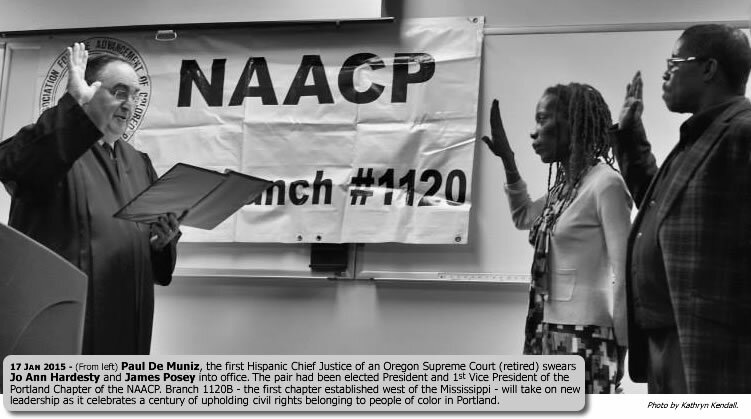 What a fantastic choice for leadership of NAACP’s Portland chapter, Jo Ann Hardesty! Thank you for your kind words. It will take us all to achieve the objectives of the NAACP. I appreciate your support. Congratulations on your new position (!) and credit and respect to you too, for all the work that you have always done over the years which has been a pillar in the community. Anyway, I wanted to ask if the NAACP will be working on anything regarding the public school system? I am asking because I’m casually and independently doing research to find out what it would take to pass a law in OR, making human and civil rights education the primary focus of the public school system (and where private schools can be incentivised to adopt tenets of such a law). I don’t have confidence that I can carry something like this through in the way that it need, only because I think my PTSD will be in the way, so I’m just trying to find out what the strengths and challenges are and to then hopefully pass the leadership on this off to an existing group, or a coalition around this. In which case I would hope to continue on in a supporting role. This is what I envision right now, but I expect things to change and that I need to be flexible. Anyway, that’s about the size of things right now. This is just regarding the logistics. The concept is a whole other conversation, but the concept is the whole driving force and reason for being. Let me know if anyone has any energy around this or contacts/leads to recommend. It’s all helpful. I’m glad I was able to connect you with other Education Advocates. Let me know how it works out.